Pinterest is one of the top ways to drive traffic to your blog or business. Learning how to use it properly can be a bit overwhelming at first. Here are my top tips for growing your Pinterest account for any blogger that is new to using Pinterest. By following these simple tips I was able to grow my Pinterest views from 4K all the way up to 100K in less than two months! I want to help you do the same. Switching to a business account is one of the most important steps to really growing your Pinterest account. You can start with a business account or convert yours easily in settings if you already have Pinterest setup. Having a business account will allow you to look at analytics, to see how well your pins are doing and to understand which ones are performing the best. Once you have switched to a business account, make sure to claim your website. You can see on the right here under settings where it allows you to do this. When you are in this screen you can click “learn more” for directions on how exactly to claim it. You must insert a code into your header/footer in on your blog to claim. I use Squarespace which already had this. For Wordpress I understand that you need a header plugin for this. Basically you need to be able to copy and paste this code into the header section of your website right after it says <head>. If you are still having trouble figuring out where to find your header section, google how to find it for your particular program you use…Wordpress, Wix, etc. You should be able to find a step by step or even YouTube video walking you through it. Once this is pasted, make sure you followed the claim steps it asks in Pinterest, then you will get an email telling you once it is complete. Yay! Rich pins are important to have because it helps your Pins be more visible in Pinterest. You need to do the above steps first before you can apply for rich Pins. You must have a self hosted website to be eligible for rich Pins. For example when I first started mine was www.nourishthefreelife.wordpress.com until I registered my domain, and now mine is just www.nourishthefreelife.com. This will be a bit of an investment, but if you want to grow your blog it is 100% worth it! Not just for rich Pins but your blog will also be taken much more seriously and it just looks nicer and more professional. I recommend using Bluehost. It starts at just $3.95 per month and in my experience they have always been really helpful and I have had no problems. Get started or check out Bluehost HERE. Next you must apply for rich Pins, through THIS LINK. Usually a link to a blog post should have metadata. Metadata is basically data about data, haha. Hopefully with your blog post you have some sort of tags on there tied to the what you wrote about. Copy & paste the URL of one of your blog posts in the form (seen below), if you have a blog you will most likely choose HTML and then apply. Hopefully then you will receive good news by email. You want your pins to be eye catching. 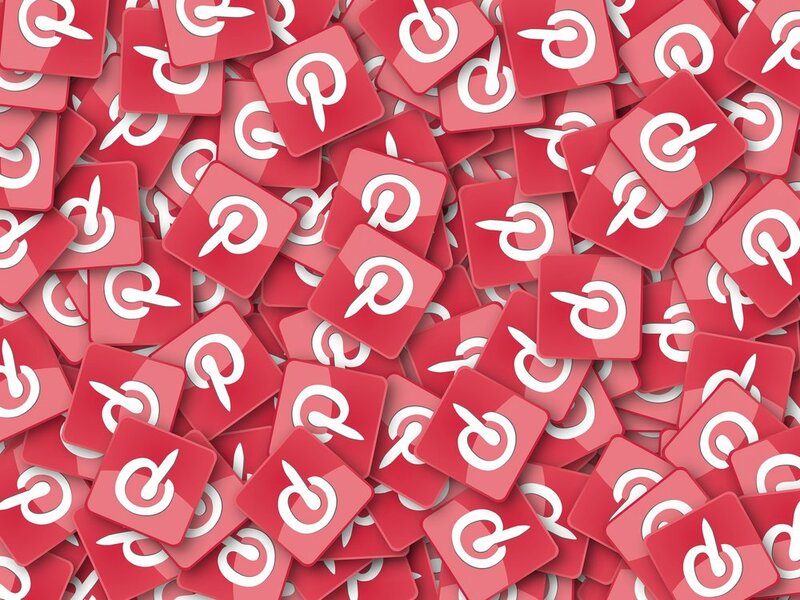 If you ever scroll through Pinterest you are most likely looking for something in particular right, like a recipe, information on a destination, etc. Do you ever spot something totally off topic that catches your eye. I sure do. Or when I am looking something up it is all about what draws the eye in, am I right? You want to create Pins that draw people to click on it. Canva is my go to site for creating beautiful Pins. You can use photos they have or upload your own. They also have tons of fonts and colors to play around with. When on Pinterest, take note of Pins that peak your interest. You don’t want to copy them exactly but you can model your Pins after those. I have noticed some blogs/business have a theme to their Pins. They create ones that all look similar. I do think this could be a good strategy as people may be able to recognize your particular style. Personally, I have not gone that route. I have been playing around with different styles. I have been able to grow very well without them all being cohesive. I do always use bright colors, however. Whichever way you choose to go, just make them appealing to the eye with bold font, always use a heading on the Pin itself along with eye catching photos. Include your blog name or website at the very bottom of each Pin. People do steal other peoples Pins, this can help prevent that and also so people can see who created the Pin. Pinterest is a search engine, not a social media site. You want to make sure you are using good keywords in your Pin titles and descriptions so it is more likely to come up in searches. The best way to do this is to search your topic on Pinterest first. 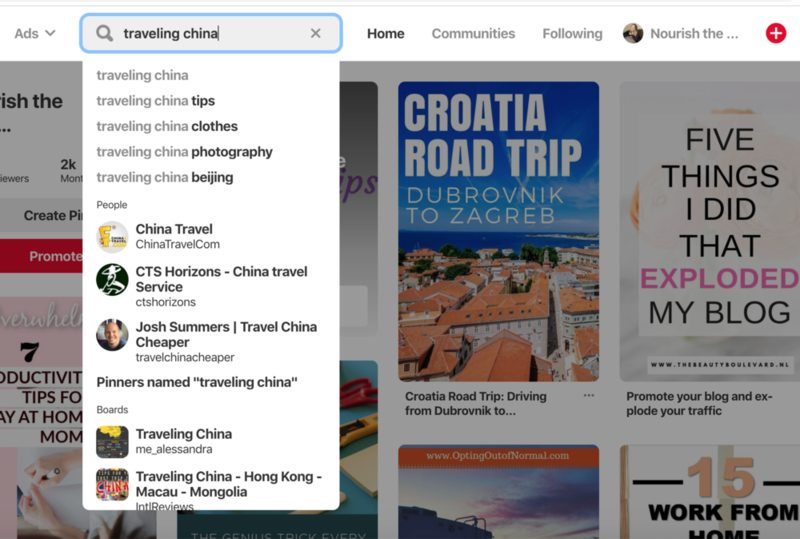 For example if you are creating a pin for a blog post that is about traveling China, you can search what are typical keywords that are searched with that. See picture below. It shows that another keyword that often comes up with that is “tips”. I used this information to create my Pin for my blog about traveling China. You can see the keywords in the drop down and also once you hit enter, they will be in different colors at the top of the screen. Now you can see my pin (right) I used this as a guide to help me title my Pin. I made sure to use these words in the description too. It is ok if it is not the exact title of your blog post. As long as it is along the same lines. Change the wording a bit to make it more searchable through Pinterest, if needed. Find collaboration boards that are in your niche(s) or different topics of your website. I blog about travel, holistic health as well as lifestyle and blogging/remote work. I am a part of several collaboration boards that are about these different topics. When I have a new blog post I will also share those pins to the relevant group board or boards. This allows for the opportunity of more repining by other board members or followers of that board. I do not necessarily think that more is better, but having a few collaboration boards per topic is great. Do not only choose collaboration boards that have huge a hug following, but do smaller ones to. It is good to be a part of both. The bigger boards technically have more exposure, but sometimes it is easier for your pin to also get lost in the shuffle this way. My pins tend to get repined more in the collaboration boards that are a bit smaller. You can also check out your analytics page to see how your pins are doing in those particular boards to decide if it is worth having or not or which ones to pin to most often. Tailwind is a separate approved site (the only approved site by Pinterest) to auto schedule your Pins. This is so helpful because not only does it Pin automatically for you, it also analyzes your account and gives you time slots that are best for your account. You can then have Pins set up to automatically Pin to your different boards. You can schedule your Pins and the Pins of others. This saves you so much time from manually pinning each day. Tailwind Tribes - these are similar to collaboration boards on Pinterest. You can search for and join tribes in your niche. You can post your pins here. Then you also must schedule Pins from other people in the tribe and they will do the same for you. Another way to get more exposure of your pins to different audiences. Try it - You can try the FREE TRIAL of tailwind first to see how it works for you. I promise this will help your views on Pinterest. Tailwind has played a huge part of how my Pinterest views have skyrocketed. This also has brought me a lot more traffic to my blog from Pinterest as a result. Do the FREE TAILWIND TRIAL, then they have a variety of different packages you can choose to sign up with after. I personally use the Plus package and for me it works perfect and is totally worth the money. Once you join tailwind and if you Pin about travel or remote work join my tailwind tribe, The Travel Babes, HERE. Spending a little bit of time each day pinning is also going to help your views increase. You do not need to just Pin your posts, but also other peoples post. A good ratio is about 60% other Pins to 40% your own to start. Once you get many more blog posts to share, you can Pin up to 80% your own Pins. You can Pin from collaboration boards, as well as Pins that you search for and meet the niche of your boards. The boards you create are actually even more important. You can get a lot of exposure, re-pinning and traffic to your website by pinning to your own boards. I actually get the most Pin impressions (this means people that see your Pin, no necessarily click on it) from my own boards. See image (left) for the list of my boards that get the most impressions. This data is found under the analytics tab of your account. It is good to have one board dedicated to your website (blog) only. Mine is titled “the Best of Nourish the Free Life.” For that board I only pin my own blog posts. The rest of my boards I have, are different but go along with my overall niche and messaging. I Pin both my Pins that fit and other peoples Pins to these boards that are in the same topic. I also created my own collaboration board which I highly recommend doing too. If you are in the travel niche I would love you to join my collaboration board The Travel babes, just CLICK HERE TO JOIN. Creating new pins is really where I feel I get the most growth. Pinterest likes when you create new pins. This does not mean you have to always have it connected to a new blog post. If you have old posts, you should definitely create Pins for those posts too and share them. You can create more than one Pin photo for each of your blog posts. This can also help you to see what pins people tend to click on more. Make them a little bit different and then you can compare which one performs better. Photos are important in your blog and also when creating your Pins. If you create pins through Canva there are many amazing free stock photos you can use and also premium ones you can pay for. The price varies on your membership. There are also a number of other sites that you can use to find free stock photos. I have listed a few of them below. Using your own photos is always great, especially travel photos. It keeps it unique and personal. However, for posts like this, for example, I tend to use more stock photos. The stock photos allow me to use high quality flat lay photos that I honestly at this point would not be able to take myself. Using a mix is completely fine. Choose a title that includes either your name or blog name, plus what you blog about. You also get space to write a short description. Use keywords here as well that also relate to your blog, so people searching know what you will be pinning about. Using a photo of yourself seems to work best. It feels more inviting and personal this way. You can see what mine looks like to the right. Create covers for your boards. I created these covers in Canva, using my logo and then adding on the title of that particular board. You then create a Pin using this photo and add it to that board. Once that Pin is in the board, go to the board settings (by clicking the little Pencil to the right or top of the board). There is an a button here to set the board cover. You can then choose the photo you created. This makes it look nice and professional in your account. Here is a close up of the settings screen of an individual board. Make sure you also put a description using key words about what Pins will be found in this board. This makes it more searchable. You can see at the bottom there is the option to add collaborators. This is where you can make it into a collaboration (or group) board, if you choose. You need a persons Pinterest username or email. You can also see the “change” button for the cover. This is where you can make the covers such as I did. Once you are also a part of many other boards, this makes it much easier to spot your own. I learned much of what I know from taking a Pinterest course by Ell Dulcos. She is a successful blogger and really knows her stuff. If you want to go more in depth and get more details of how you can grow your Pinterest and more tips on these different steps, take her course HERE. This course is low cost and very much worth the money. If you follow these guidelines you will start seeing an increase in your Pinterest activity. It just takes a little bit of time and consistency to get it going. Just as little as 15 minutes a day can bring you Pinterest growth. I hope you find these explanations easy to follow and that you will soon be on your way to your Pinterest account exploding!